I would think so sense it does have the kurdish writing on one side, I would guess this has been in the works much longer that we think. I dont know whats worse you stole your moms money or that you were a young boy playing with lipstick lol. Actually it is the process of interfering with forex rates and employing a dual rate system that requires unique circumstances yes just hit the button! How's that for unique! Dr Clarke Calls It For Monday October 3rd And Gets Called Out By MY LADIES ! MY LADIES Call Out Some Other Site ! “Tens of thousands” of fraudulent Clinton votes found in Ohio warehouse By admin1 - September 30, 2016 Election officials in Franklin County, Ohio are reportedly stumped over what one maintenance worker found in a dilapidated downtown Columbus warehouse earlier this week. According to sources, Randall Prince, a Columbus-area electrical worker, was doing a routine check of his companies wiring and electrical systems when he stumbled across approximately one dozen black, sealed ballot boxes filled with thousands of Franklin County votes for Hillarious Clinton and other Democrat candidates. “No one really goes in this building. It’s mainly used for short-term storage by a commercial plumber,” Prince said. So when Prince, who is a Trump supporter, saw several black boxes in an otherwise empty room, he went to investigate. What he found could allegedly be evidence of a massive operation designed to deliver Clinton the crucial swing state. Prince, shown here, poses with his find, as election officials investigate. Early voting does not begin in Ohio until October 12, so no votes have officially been cast in the Buckeye state. However, inside these boxes were, what one source described as, “potentially tens of thousands of votes” for Hillarious Clinton. Christian Times Newspaper has not yet been able to obtain a photocopy of one of the ballots found inside the box, but an affiliate in Ohio passed along a replica of what was found. It is important to note that the above replica coincides with a ballot that a Franklin County voter would cast at the polling place on Election Day, meaning the Clinton campaign’s likely goal was to slip the fake ballot boxes in with the real ballot boxes when they went to official election judges on November 8th. Ohio, a perennial swing state in the presidential election, has been a challenge for Clinton and her Democrat counterparts in 2016. Many national Democrat groups have pulled funding from the state entirely, in order to redirect it to places in which they are doing better. Clinton herself has spent less time in Ohio, and spent less money, in recent weeks as it has appeared that Trump will carry the crucial state. With this find, however, it now appears that Clinton and the Democrat Party planned on stealing the state on Election Day, making any campaigning there now a waste of time. This story is still developing, and CTN will bring you more when we have it. but yet not on CNN...if this was Trump it would be all over every news outlet across the WORLD!!! The new monetary policy is coming.! Yes off course you only have to look at other countries rates to know they should be higher than what they are! .30 is the minimum I would think! Let me remind you brother.... there is no such thing as "just a trucker" when your ridin' with the Lord ...here's a little humor to bring that point home! Awesome news! And right in time! Now the Kurds will vote on it on Oct 4th. Sounds like the Kurds won't have an independent state, but fairly close.. which is much better for us IMO. thanks Yota for bringing this!! Huge news!! 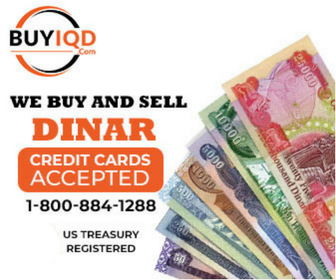 We stand by your side because we have a TON of Dinar and want you to grow and prosper so we can cash out huge when you revalue!!! Let's keep it real here!!! ***/// Yup... that's how the demoncrats roll, alright. Classic evil..... No surprise. They oughtta fingerprint n' DNA-test the whole damned mess... whatta ya bet those'll all come back a positive match for criminals of every persuasion. So they see the other side closing in and instead of moving in to campaign and carry the State, they just write it off..? Yuh, why bother, they know they're going to win it with this epic deceit. Not to mention the usual habit n' practice of all those on the 'gorged' soros payroll who vote multiple times, campaign workers who resurrect the dead to vote, and their all-time go-to base -- the ACORN movement. . . I would have to agree with you. Seems like a lot of stuff is lining up, tons of love between everyone, and a lot of smoke and dates from the GOI being published. I thing we have a shot for this to get done by the end of the year. If the GOI was to delete the zeros in early 2017 the whole plant would be buying dinar. I enjoy watching Ancient Aliens as much as the next guy - but really - WTF ????? What's Another Word For Thesaurus ? He is on the GOOOOD Iraqi dope!! I don't see how they can hold the dual exchange rate any longer with all the investments pouring in! Thanks for all the amazing news Screwball!! Looks like someone pulled their thesaurus off the shelf and dusted it off! there is no more room for hesitation when it comes to the unification of forex rates," Masoud Khansari was quoted as saying by khabaronline.ir news website. Single currency rates are a crucial requirement for the reintegration of Iran into the global banking system and payment networks. come on baby! The Economic Impact Of The Bilateral Deficit In Iraq ! There Ya Go 10 Years - The Great SandFly Has Answered Ur Plight ! I took it as instead of the dual rates it will be just one, not 1:1 right now there is a street rate and a cbi rate. I can't see them going to 1:1 even after they rv, I'm hoping for around 10 cents. I still think we have some time yet before this pops....hopefully not too much longer though lol. Ya know jeepguy, I didn't wanna respond to this article because of the political nature of it. But you point out something that I first thought when I read it. Maybe Congress knows what should have happened by now and hasn't, so in there frustration they are saying , " get your Shiite together or else". This says it all. They steal it as fast as they get it. And feel a lot of members of Congress, frustrated by the Iraqi government. They fear that the United States sent a lot of money to Baghdad without achieving sufficient results due to corruption and inefficiency. PLEASE pray for my husband Ron! Hello Again, On Thursday, after we went to Ron's cardiology follow-up appointment, we had lunch at Friday's, one of our favorite places. They have wonderful sandwiches with Jack Daniel's sauce and Jack Daniel's mayo. Grilled chicken or hamburgers. Anyway, during the meal, Ron said he wants us to make this Christmas REALLY special, since he feels it may be his LAST! This really broke my heart! Please PRAY that this does NOT happen to him, and us! Thank you and God bless, my wonderful DV family! !